There is a new book recently published in South Africa called “Zulus at Bay”, which will be of interest to all subscribers to the Rorkes Drift Web Site and to anyone interested in the Anglo Zulu War of 1879. The author is Denis Barker who is the grandson of Trooper William Walwyn Barker of the Natal Carbineers who was one of the fortunate few to escape from the battle of Isandlwana. The history of the white man's colonisation of what is today KwaZulu Natal, and the resultant relationship between the Zulu and their foreign invaders, is the subject of this excellent book. Written from the author's 'colonial' standpoint, it uses contemporary written and oral sources, as well as some more modern written interpretations of events, to clearly and vividly describe the history of old Zululand up to the period immediately after the battle of Isandhlwana. 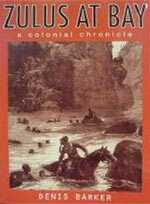 The highlight of the book is Mr Barker's depiction of his own grandfather's flight from Isandhlwana. Trooper William Walwyn Barker of the Natal Carbineers made a spectacular escape from the jaws of almost certain death; his [un-rewarded] bravery saw him give up his horse whilst in mid-flight to a man whom he thought a more worthy cause! This whole terrifying episode is told in plain and unembellished prose which helps to make Trooper Barker's actions all the more remarkable. Subsequently, the author makes mention of Trooper Barker being awarded the Victoria Cross for his actions, but sadly this did not happen. As to why the award of a VC to Trooper Barker did not happen is an interesting footnote to the Victorian military culture. Mr Barker's own 'colonial' views on Imperial honours and awards system are expressed in his customary straight forward and common sense style. The book goes on to give brief details the Natal Carbineers' final actions up to the point of the Units return to Pietermaritzburg in July 1879. Throughout, the book is enhanced by a number of familiar illustrations of personalities of the period and some useful maps. This book would certainly appeal to any reader interested in the events of 1879 and to the general reader with an historical interest. My only criticisms are that the book lacks notes of any form and that there is not a more comprehensive bibliography. However, small detractions from a very enjoyable read. This title is privately published by the author, although it is available from a number of leading book outlets in South Africa and on-line. The book is detailed when in the build up to the War and also the battle itself as Denis has been able to use the diaries, records and other information that the Barker family have, as well as recollections of anecdotes passes from father to son. Nevertheless the book is more extensive than this and deals with the growth of colonialism in South Africa and the conflicts that consequently arose. I would advise anyone reading this book not to skip the introduction. I appreciate that many people do not skip introductions but others, like myself, like to get on with the book and leave the introduction till later. In this case the introduction is important in that it explains the perspective from which this book has been written. The title has been chosen because of the premise that the Zulus and other native people were “at bay” from the start of the colonisation of the country. It also explains the feelings of someone who has a “foot in both worlds” as Denis who is a South African of British descent explains. The history of the development of the country is worthy of a careful reading but as it moves towards the War if becomes gripping. Denis describes the events including his grandfather's miraculous escape via Fugitives Drift and his incredible bravery with all the modesty that his grandfather must have shown. He addresses the issue of his grandfather's worthiness for the highest award of a V.C. which he did not get and the possible reasons for it. Was this Victorian snobbery to a “Colonial” or a desire not to shed too much light on Isandlwana when there was Rorkes Drift to consider instead? The book does not shrink from challenging what has become the modern and revisionist view of the battle that the British made no strategic mistakes but were simply overtaken by a superior force. He challenges this head on with not even a nod in the direction of political correctness. The book justifies itself on those grounds alone but goes further to explain that, although it was indeed a war of colonial expansion, there was in fact at the time a genuine fear of Cetshwayo felt by the residents of Natal and their need to protect themselves. The book is provocative whilst at the same time being learned and balanced and well researched. I would commend it to all serious students of the Anglo Zulu War.